Taking a break from city life is a good thing to do from time to time. Not that York can ever be considered akin to a New York or a London, but it is still a city and for some unfathomable reason THE place to go for hen and stag parties in North Yorkshire (hot pink feather boas, anyone?). 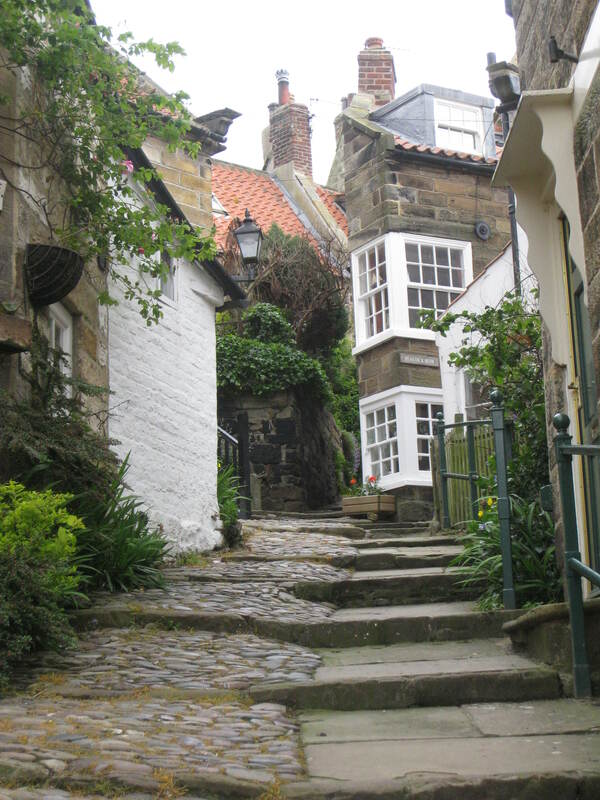 So it was in good faith that we decided to take a day trip with the intention of hiking part of the Cleveland Way, the 110-mile path that runs along the North Moors and the North Sea, from Robin’s Hood Bay to Whitby, the inspiration for the setting of Bram Stoker’s Dracula. We first took a train east to Scarborough, a North Yorkshire town on the North Sea and birthplace of the actor Ben Kingsley. Scarborough didn’t leave much of an impression as we were there not to sight-see but to catch a bus to Robin Hood’s Bay. 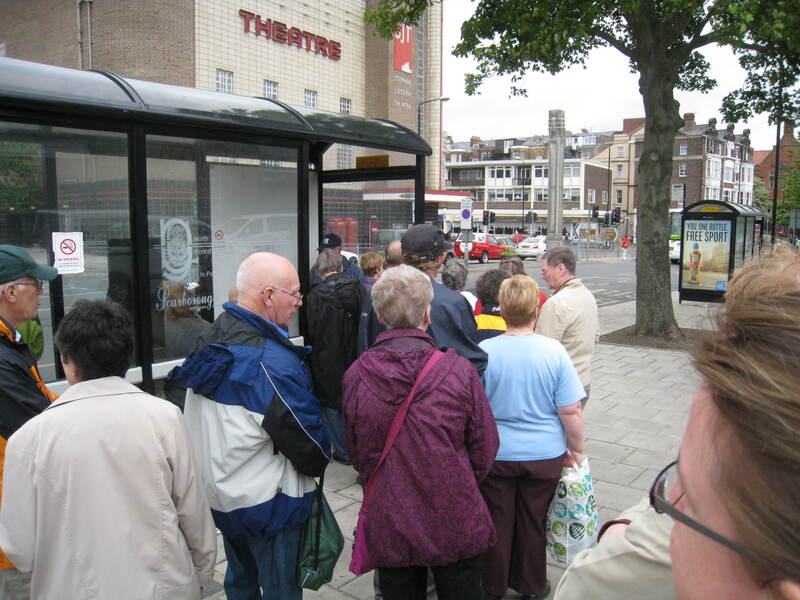 The stop for the 93 was right outside the station, where a line, or, should I say “queue” had already begun to emerge. It is amazing to me how people in this country will calmly and patiently line up to wait for the bus. There is no “every man for himself” mentality that I have experienced in other cities around the world. Take San Francisco. Try and board the 45 at Union Square and not get elbowed aside by shriveled yet surprisingly sprightly old Chinese ladies carrying their ubiquitous pink plastic shopping bags who believe that getting on that very bus expeditiously is a matter of life and death. On this line in Scarborough we chatted with a friendly young local from Whitby, whom I’ll call Alfie, who couldn’t say enough about the place. We told him that we were off to Robin Hood’s Bay from where we would start our walk to Whitby and we continued to chat about both places after we boarded the bus together. The drive to the bay was lovely, however there were moments when our driver confused himself for a Grand Prix racer and thought the purpose was to break speed records (facing toward the back of the bus didn’t help my stomach either.) We drove through quaint hilly towns with red brick buildings and expanses of lush farmland hugging the cliffs overlooking the sea. At one point we slowly went up a hill past a paddock with sheep and lambs. The lambs were so small and adorable and I enjoyed watching them frolic in the grass, in a peaceful reverie, only to be disturbed by Alfie when he looked out and said “Mmmm, lamb chops.” Nice. Finally, we arrived in Robin Hood’s Bay. Since it was low tide, we were able to walk down to the water and out a bit to see if we could spot any fossils as we were told they are there in spades. No fossils, but plenty of school groups and dogs running along the rocks, kicking up sand. 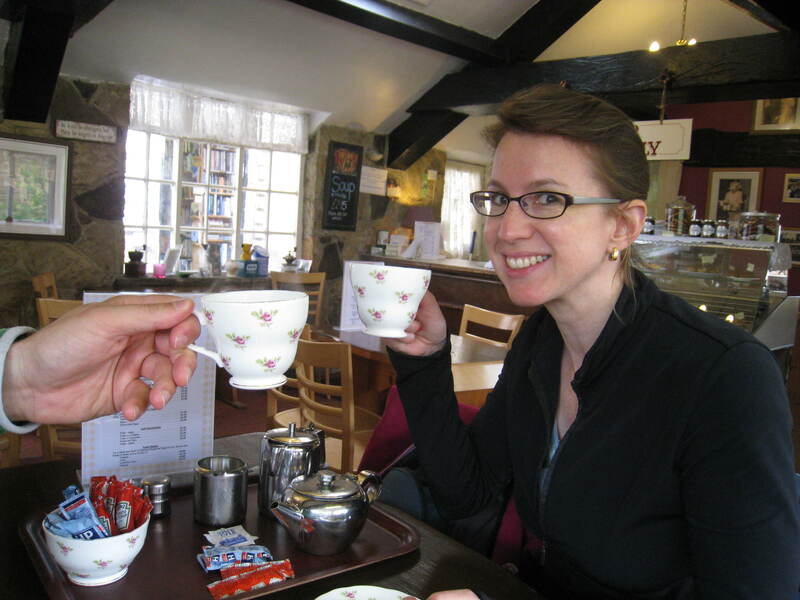 After fortifying ourselves with some English grub and Yorkshire tea at a cute little cafe, we headed off for the trail. It was only after another friendly local told us the way that we were able to find the trail head on Mt. Pleasant South. 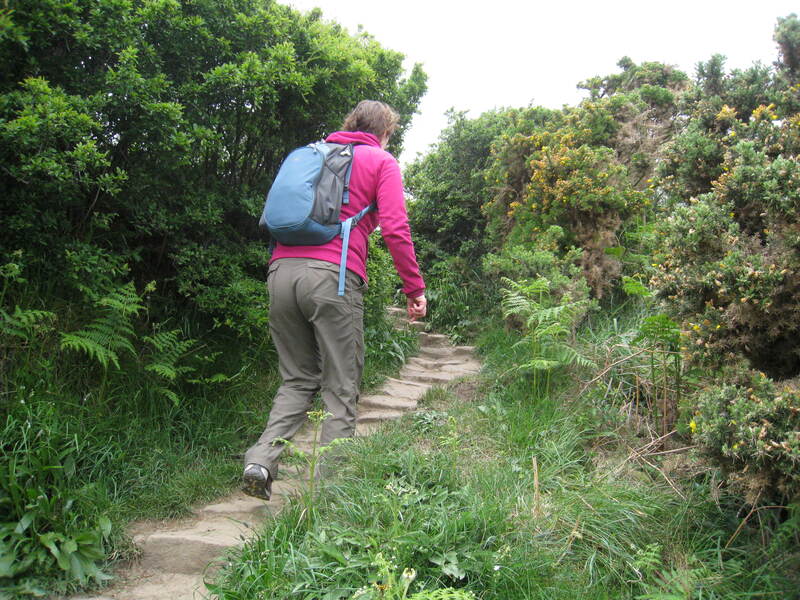 The hike we were about to undertake to Whitby was 7 miles long, a small portion of the Cleveland Way. 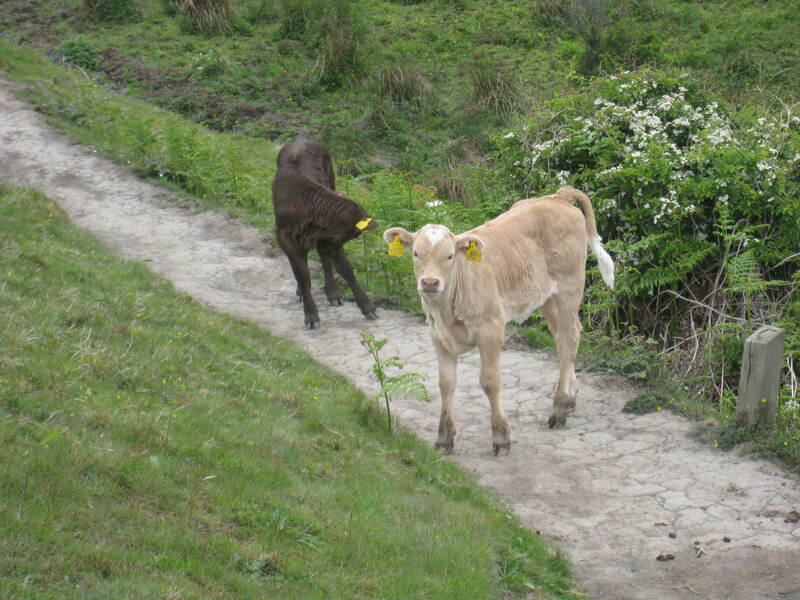 The trail itself skirted the cliffs overlooking the North Sea and took us through pristine farmland and green paddocks, under droopy tree canopies, over rocky streams, past glorious yellow and majestic purple blooms. It was magical, and one of the most invigorating walks I have been on. We met all creatures great and small along the way including sheep, lambs, cows, calves, dogs, seagulls, birds of all sorts and several other hikers who in typical friendly Yorkshire fashion greeted us with a “Hallow!”, “How do?”, “Hiya!” or “You alright?” This last one is a bit problematic for me as it always sound as if the speaker is inquiring into my physical or mental well-being because he or she has some sort of inside information on me. I inevitably think “Why wouldn’t I be alright? Do you know something? Is there something on my face? Is my eyeball hanging out? Do I have the pallor of the walking dead? Tell me! What? WHAT! ?” It has taken a while but I now know that “You alright?” is the equivalent of “How’s it going?” or “What’s up?” You know, those things we just say but don’t really care to hear the answer to. Anyway, after about two and a half hours of walking, there it was in the distance: Whitby Abbey. Another victim of Henry VIII’s Dissolution of the Monasteries, Whitby Abbey today is a mere partial skeleton of its original glory, a splendid Benedictine monastery overlooking the North Sea. This was an important site in the early Chuch, for it was where the Celtic and Roman Synods convened in 664 to disagree over when to celebrate Easter (Rome eventually won.) 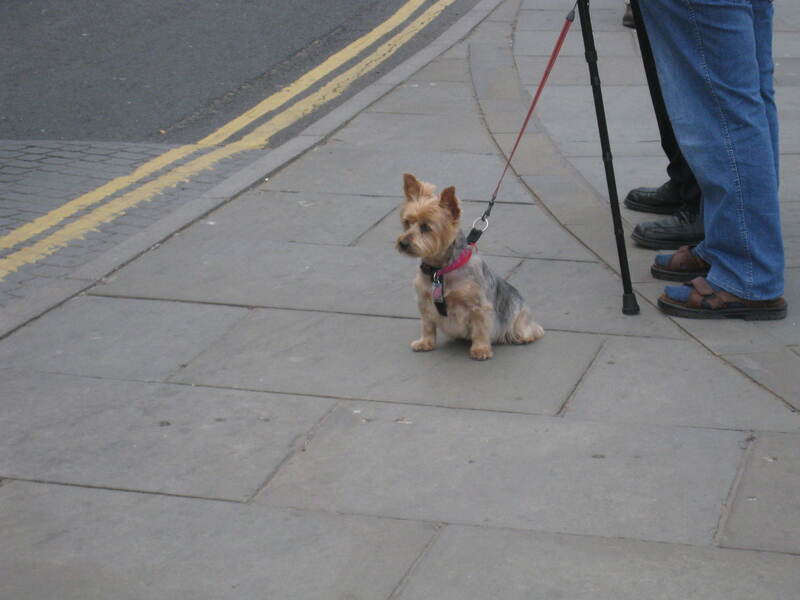 As we got closer to it we remembered a tip Alfie gave us – he of lamb chop fame – that the locals never pay the admission fee to the abbey but simply scale the wall. Now, I am a supporter of the many museums, cathedrals, churches, stately homes and palaces under the auspices of English Heritage and The National Trust (Steve and I became members of the latter). But I will be damned (probably not the right word to use in this instance) if I am going to pay to “enter” a ruined abbey. Ha! So scaled the wall at its lowest point we did. Absolutely worth it. 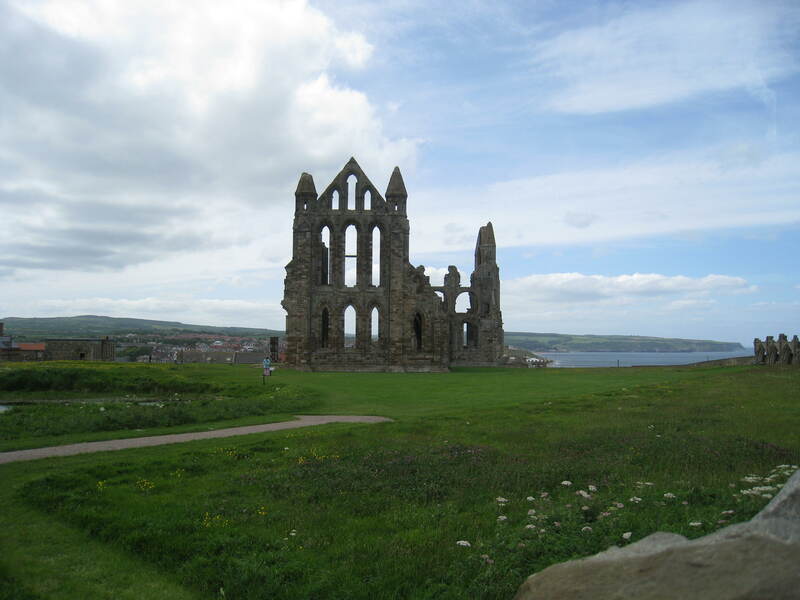 The abbey must have been impressive in its heyday as it sits on the high point overlooking the port town of Whitby and was painted in alternating colors of red and white in its interior, the remnants of which we could still see. There is something both nostalgic and romantic about seeing a structure such as this and I can see why people stage their weddings (or at least photos of the wedding party) in such a setting. With its massive columns, glassless gothic windows with impressively high arches, walls adorned with such disparate but delicately carved objects as flowers and gargoyles, (and by the sea to boot! ), what’s not to love. As impressive a feat as constructing such an abbey is, especially considering the rudimentary construction materials those early masons and builders had at their disposal, what is almost equally as impressive is how to take one down. Do ropes over the turrets and a little elbow grease to pull them down do the trick? Do you take out the ceiling (if so, how? ), break the windows and let nature do the rest? How long does this all take? If only to go back in time and ask them these questions. But then I would have been branded a witch. Forget that. After walking about the abbey ruins we made our way into the town of Whitby itself. 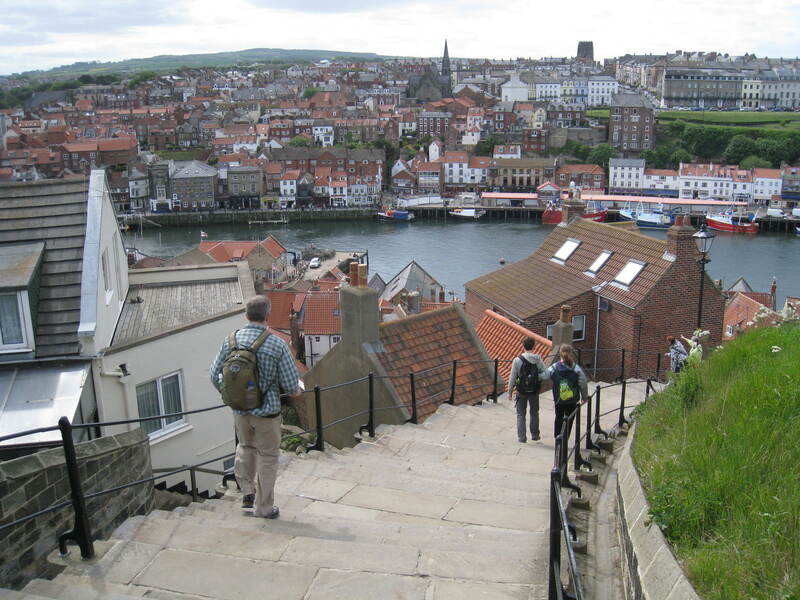 I was a bit surprised at the size and location of Whitby, as it is quite a large port town with a bustling tourist industry and fish trade and we approached it from the abbey, which meant that we had to walk down to it and to the water. Robin Hood’s Bay used to be the primary port city along this expanse of the coast but at some point Whitby took over. Many traders today not only cater to the tourist with boat rides, fish and chips, the trite and schlocky array of shells pasted on other shells, driftwood art and coffee mugs with pictures of seagulls, boats, sailors or any other seaside town cliché, but also with jet. Jet is a semi-precious gemstone, a mineraloid, created from decaying wood which has been subjected to extreme pressure. ( I got this from the sign in the jet shop window across from the pub where we stopped for a swift half.) It is black ( jet-black!) and came to prominence after Queen Victoria wore jet jewelry while in mourning over the death of her husband. Apparently Gwyneth Paltrow also wears it, or at least did in a movie, or something, as I saw photos of her in many of the jet shops. She seems to think herself a royal, so I guess it fits. Whitby also lays claim to Captain James Cook, the discoverer Australia, although he was not born in Whitby but merely apprenticed there. But Whitby’s real claim to fame, and another thing the tourist traps proffer in various forms, is Dracula. Bram Stoker was one of many Victorian writers who came to Whitby. Charles Dickens came here, as did Wilkie Collins and Henry James. 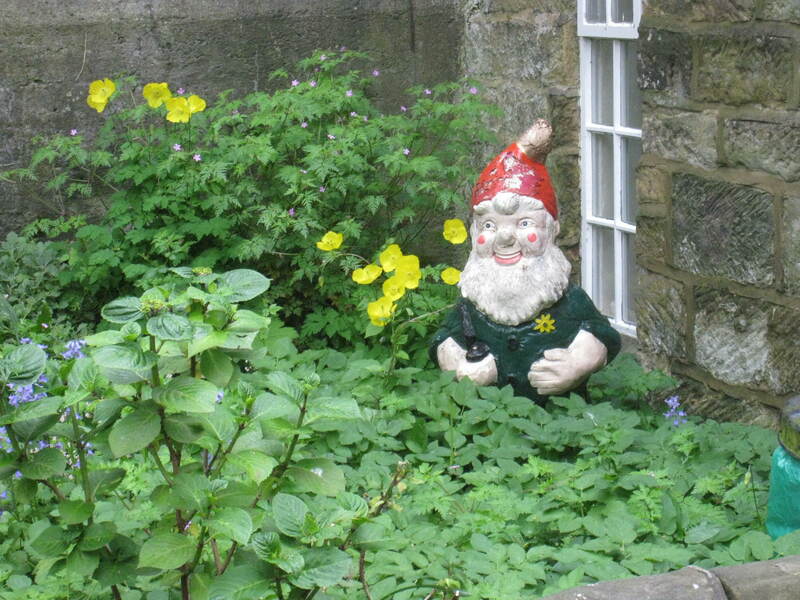 Whitby became a fashionable holiday retreat and a mini-writers colony. Stoker was said to be so inspired and enchanted by Whitby that he set three chapters of Dracula here. But really it is where he encountered the name Dracula in a book he borrowed from the Whitby Library. Today, if you don’t want to actually read the novel Stoker so lovingly labored over, you can go to the Dracula Experience (Love Never Dies! ), buy a Dracula costume, in the plastic or cloth varieties, or attend the annual goth weekend in May. 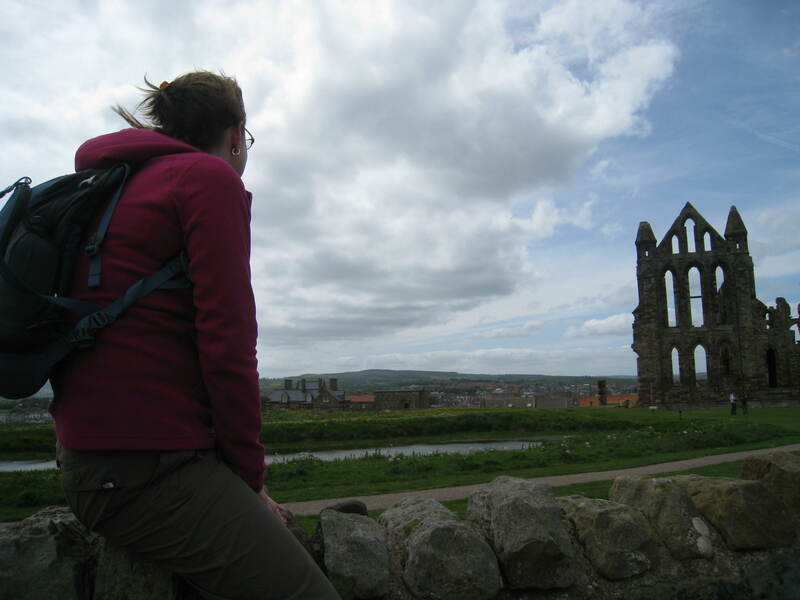 I can’t say I felt any particular literary pull in Whitby, save for the abbey, which does have its macabre charm, but evidently it served as muse to many a writer, or at least a place to take in the air for a while. The dogs seem to like it. Wind-chaffed, and with aching legs, we took the bus back to Scarborough, and then the train back to York, looking forward to a hearty dinner and a few pints overlooking the Ouse. Approaching the abbey. And the wall.